Everyone longs to have that one special person in their life; someone who knows them so well that without thinking they can easily finish each others’...sandwiches. 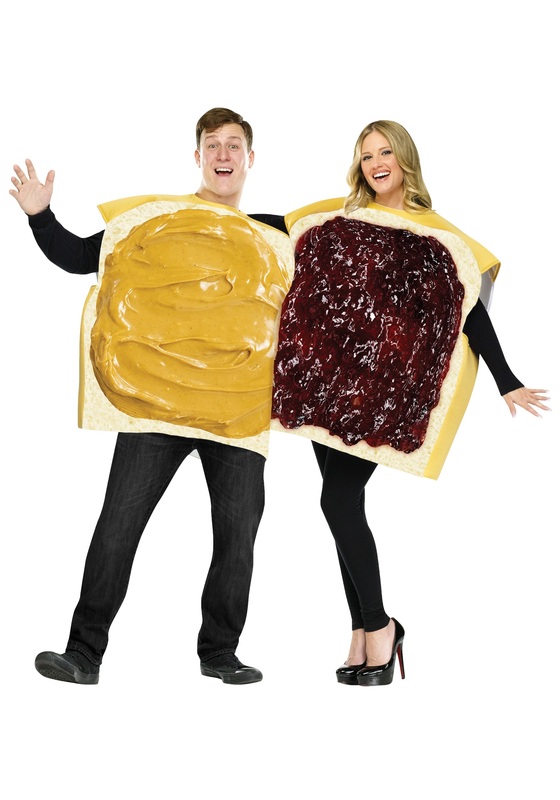 Whether your other half is a friend, family member, forever sweetie, or even a frenemy, this Adult Peanut Butter and Jelly Costume is the perfect sustenance for your Halloween plans. Bound to be a mainstay for years to come, this costume couplet is as foolproof as your favorite lunch--dependable, timeless, and loved by all. Plus, you get two costumes in one! That’s almost as good as a perfectly made PB & J (cut on a diagonal, of course) that has just the perfect proportion of jelly to peanut butter and nothing spilling out of the sides. That’s hard to beat. The peanut butter and jelly of these costumes look so real that you'll make your party guests hungry for a quick sandwich. Distract them from them hunger pangs by asking them how they like to make their signature sandwich. Everyone has a unique style, like a PB & J fingerprint--from crustless, to double-layered peanut butter, to wheat bread or white! We like our with homemade jam and crunchy peanut butter, but there’s really no wrong way to assemble America’s favorite sandwich. So. go grab your special someone and a pair of basic black pants and shoes. The hard part is over--you’ve found yourself a soul mate; everything that comes after should be as easy as a PB & J!